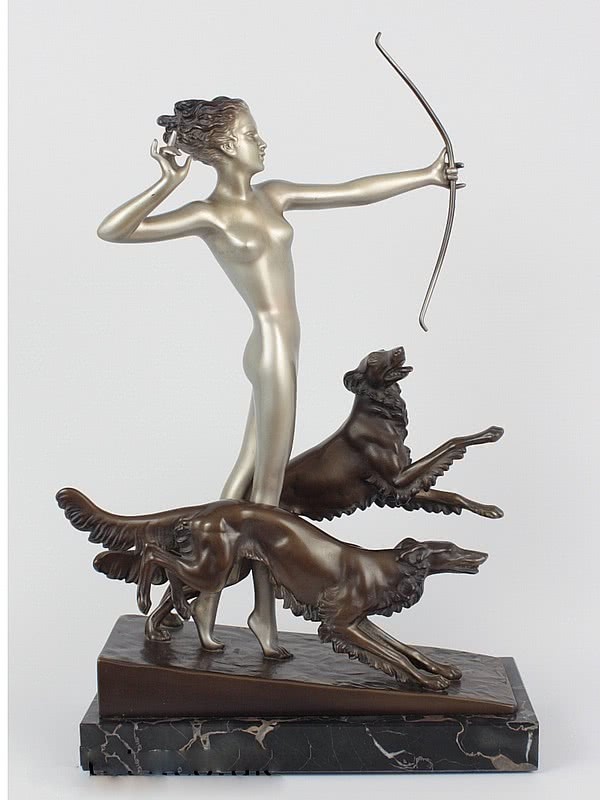 Josef Lorenzl - A Large Art Deco Austrian bronze figure entitled "Diana", circa 1930 depicting the stylised Goddess running with her hounds, with a patinated and silver lacquered cold-painted finish, mounted on a portoro marble base. This is a beautiful Lorenzl bronze figure, full of movement and style and photographs really cannot do it justice. Josef Lorenzl (1892 Vienna - 1950 Vienna), an Austrian sculptor and ceramicist of the Art Déco period. 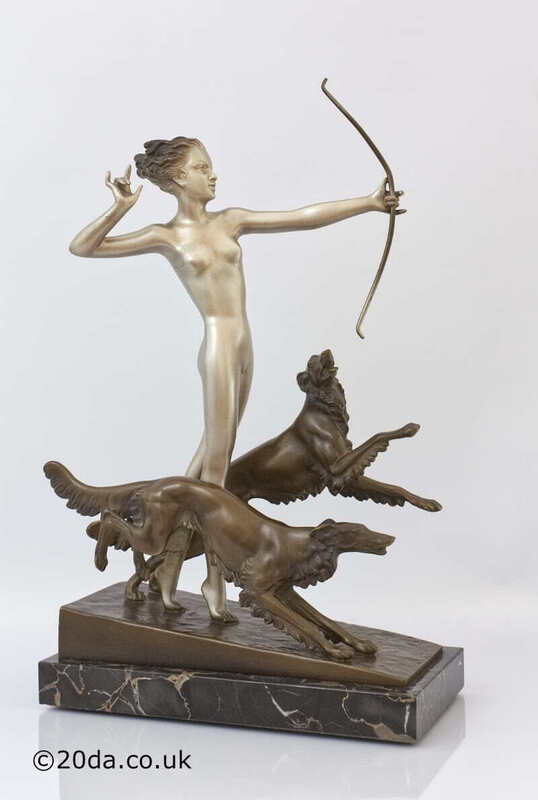 A prolific and talented sculptor working in the early part of the 20th Century Josef Lorenzl (original spelling Laurenzl) started his career working at a foundry in the Vienna Arsenal (a military storage complex located in the south-eastern part of Vienna) where he learned the techniques of bronze casting. 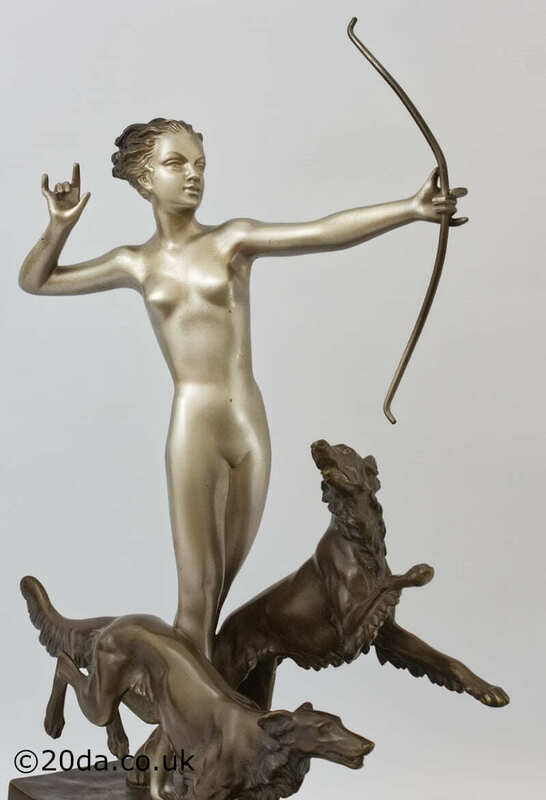 Here Lorenzl produced many bronze and chryselephantine (a Greek word for precious metals and bronze combined with ivory) sculptures and also works in spelter. Entranced by the female form, he became well known for his slim dancers with their long legs and exuberant movement. Many of these are "scarf dancers" and the name "Crejo”(a painter and a friend) also appears on some bronze figures when Crejo has painted floral decoration on to the cold-painted bronze finish of the clothing. 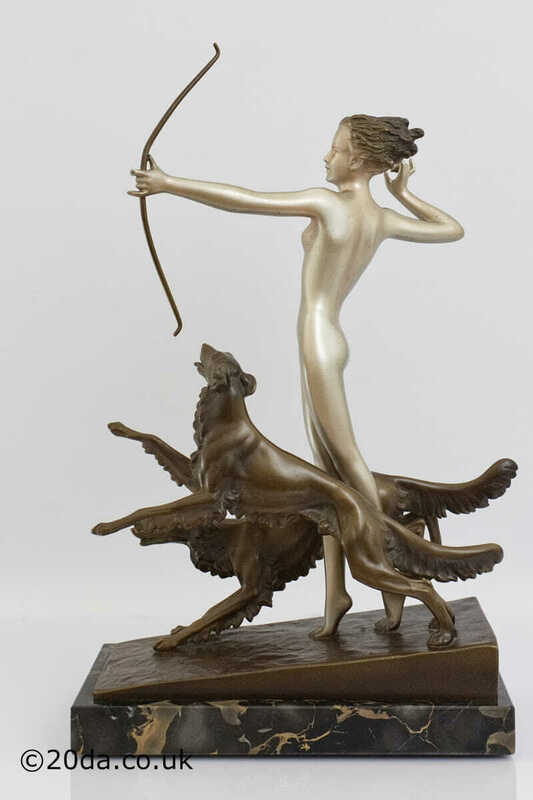 Due to the success of his bronze figures, Lorenzl was approached by the firm of Goldscheider and subsequently designed pottery figures for them, working from a studio on the company grounds (he also brought Stefan Dakon into the company). As with his chryselephantine pieces, his ceramic works were in great demand and became the embodiment of the Art Deco period. Famous among these is "The Butterfly Girl" modeled after the famous dancer Niddy Impekoven who worked in the 1920s. Many other works were inspired by photographic models and cabaret and film stars of the 1920s and 30s. Josef Lorenzl also worked for other Viennese firms which included Hertwig and Keramos.